Air Canada is looking to brighter days as the high summer travel season approaches after recording a loss for the first three months of 2014. Its performance during 1Q2014 was mixed as Air Canada turned a favourable cost and top-line revenue performance, but experienced pressure in the domestic and Pacific markets, which limited the airline’s ability to get traction in yields. The carrier is also continuing to battle pressure created by the depreciation of the CAD against the USD, which also helped contribute to Air Canada’s quarterly losses. It appears Canadian carriers are likely to feel currency pressure throughout 2014 as Air Canada estimates an exchange rate of CAD1.10 to the USD for the year. After a tough 1Q2014 Air Canada does see upside in subsequent quarters, touting strong demand as the busy summer travel period gets underway in the latter half of 2Q2014. Although it is not certain if demand is robust enough for a turn in the carrier’s fortunes. Air Canada’s passenger revenues grew 3.2% in 1Q2014 to CAD2.6 billion as each region recorded positive revenue momentum except for the carrier’s domestic markets, where revenues fell 1.5%. Challenges in the Canadian domestic and long-haul Pacific markets pressured Air Canada’s unit revenues, which fell 0.5% year-on-year. On a unit basis, Air Canada recorded yield and revenue growth in its US transborder and Atlantic markets, which were offset by declines in the airline’s domestic and Pacific markets. Air Canada attributed a 4% rise in passenger unit revenues in US transborder markets to a 2.9ppt increase in load factor year-on-year during 1Q2014, as yields were essentially flat year-on-year, inching up 1%. During 1Q2014 Air Canada increased capacity on longer-haul US routes to San Francisco, Los Angeles, Florida and Las Vegas while trimming supply in shorter-haul markets including New York, Washington DC, and Boston, routes where the carrier has been experiencing capacity and pricing pressure during the past year. Air Canada also pulled back capacity on its service to Hawaii during the quarter. Airline executives cited healthy demand on routes to Florida, California and Las Vegas, noting they were pleased with how demand was holding up in those markets. Air Canada also highlighted healthy point of sale demand for connecting traffic from the US through its hubs in Toronto, Montreal and Vancouver to the its long-haul markets. Air Canada also turned a positive performance on its North Atlantic routes, growing yield by 7% and unit revenues by 0.7% on a 7.6% increase in capacity. The carrier’s favourable yield performance in the Atlantic was driven by higher average fares year-on-year and higher-yielding traffic in all fare classes, including premium economy. Air Canada offers extra legroom on high-density, 458-seat Boeing 777-300ERs operated from Vancouver to Hong Kong and London Heathrow and Montreal to London Heathrow and Paris. The carrier highlighted the particular strength of premium economy on flights between Montreal and Paris and Vancouver to London. Yields and unit revenues in Air Canada’s Pacific markets fell 1.6% and 2.8%, respectively, during 1Q2014. The carrier attributed the decline in yields to increased industry capacity from Japan and aggressive pricing in some of its Pacific markets. Air Canada’s fellow Star Alliance partner All Nippon Airways (ANA) launched flights between Tokyo Haneda and Vancouver, ANA’s first destination in Canada during 1Q2014. The airlines have forged codesharing to some of Air Canada’s markets beyond Vancouver and ANA routes beyond Haneda. However, the connection scenario is not optimal since Air Canada operates service from Vancouver to Tokyo Narita, not the downtown Haneda that ANA uses. Japan Airlines also operates service from Narita to Vancouver. Air Canada also cited a higher proportion of lower-yielding traffic pressuring its yields to Hong Kong, which the carrier serves from Toronto and Vancouver. Vancouver-Hong Kong is one of the markets where Air Canada deployed its higher-density 777s as it worked to maximise higher leisure passenger volumes on certain routes. But the carrier has stated that the unit cost benefits of those denser aircraft far outweigh the diminished unit revenue performance. 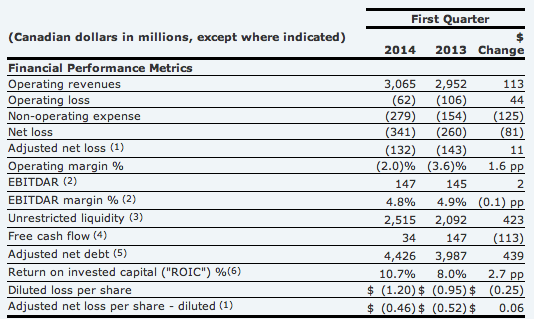 The domestic market was challenging for Air Canada in 1Q2014 as yields fell 3.5% and unit revenues declined 5.5%. Yield weakness was driven by an increase in industry capacity, pricing pressure and a renewal of a deal that Air Canada’s rival WestJet reached with Sabre to list its inventory in the company’s GDS system. Air Canada observed that WestJet ended up booking more travel earlier in the cycle than in the past, which changed demand patterns within Canada - at the same time noting that booking and distribution panels are returning to normal. The carrier is encouraged by healthy booking trends in all its geographies as the high demand summer season gets under way in 2Q2014. But there are certain nuances in its regions that could create interesting dynamics for Air Canada in 2014. A new source of competition is emerging as Delta Air Lines launches flights from Vancouver to Seattle in Jun-2014 to feed its Asian network over Seattle, which includes new service to Hong Kong also beginning in Jun-2014. 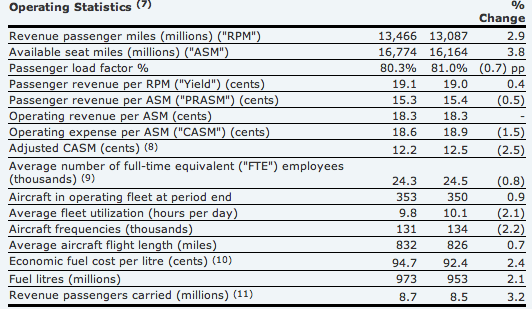 Air Canada’s unit costs excluding fuel fell 2.5% in 1Q2014, which was in line with previous guidance, and continues encouraging cost trends reported by the carrier beginning in 2013. The airline is revising its unit cost guidance for FY2014, and now forecasts a 3% to 4% decline versus prior projections of a 2.5% to 3.5% decline. Its favourable unit cost revisions are driven by lower maintenance and amortisation expense. Air Canada’s favourable cost performance couldn’t carry the airline to a profit in 1Q2014 as CAD161 million (USD56 million) in foreign exchange losses helped widen its year-on-year loss by CAD81 million (USD74 million) to CAD341 million (USD313 million). Fallout from severe winter storms also contributed to Air Canada’s quarterly loss and an operating deficit of CAD62 million (USD57 million), a CAD44 million (USD40 million) improvement year-on-year. It is difficult to predict if the favourable demand Air Canada sees in its various geographies will materialise into improved unit revenue results in 2Q2014 and beyond. The carrier shies away from providing revenue guidance, making it challenging to get a clear picture of just how strong demand will be in the high summer season. Air Canada could see further pressure in the domestic market in 2Q2014 as WestJet’s regional subsidiary expands eastward, launching flights from Toronto to Thunder Bay and from Thunder Bay to Winnipeg. Air Canada serves both those routes and Porter Airlines operates service from Toronto to Thunder Bay. While there does not yet seem to be an overcapacity scenario in domestic Canada, both Air Canada and WestJet are growing capacity in CY2014, with the likelihood of increased pricing pressure, given the depreciation of the CAD. Air Canada has done much work in the last couple of years to get on solid financial footing; but challenges still linger for the carrier in domestic and long-haul markets. If strong demand fails to produce revenue traction in subsequent quarters, Air Canada may have to adjust its capacity targets and fine tune its revenue management. Its domestic and international market strategies are still works in progress, as dynamic external pressures persist.